Carl Ludwig "Luz" Long (27 April 1913 – 14 July 1943) was a German Olympic long-jumper, notable for winning the silver medal in the event at the 1936 Summer Olympics in Berlin and for giving technical advice to his competitor, Jesse Owens, who went on to win the gold medal for the long jump . Luz Long won the German long jump championship six times in 1933, 1934, 1936, 1937, 1938, and 1939. Long was killed in action serving in the German Army during World War II. The 21-year-old, 1.84 m tall Long had finished third in the 1934 European Championships in Athletics with 7.25 m. By the summer of 1936, Long held the European record in the long jump and was eager to compete for the first time against Jesse Owens, the American world-record holder. The long jump on August 4 was Long's first event against Owens, and Long met his expectations by setting an Olympic record during the preliminary round. In contrast, Owens fouled on his first two jumps. Knowing that he needed to reach at least 7.15 m (about 23 feet 3 inches) on his third jump in order to advance to the finals in the afternoon, Owens sat on the field, dejected. Speaking to Long's son, Owens said in 1964 that Long went to him and told him to try to jump from a spot several inches behind the take-off board. Since Owens routinely made distances far greater than the minimum of 7.15 m required to advance, Long surmised that Owens would be able to advance safely to the next round without risking a foul trying to push for a greater distance. On his third qualifying jump, Owens was calm and jumped with at least four inches (10 centimeters) to spare, easily qualifying for the finals. In the finals competition later that day, the jumpers exceeded the old Olympic record five times. Owens went on to win the gold medal in the long jump with 8.06 m while besting Long's own record of 7.87 m. Long won the silver medal for second place and was the first to congratulate Owens: they posed together for photos and walked arm-in-arm to the dressing room. Owens said, "It took a lot of courage for him to befriend me in front of Hitler... You can melt down all the medals and cups I have and they wouldn't be a plating on the twenty-four karat friendship that I felt for Luz Long at that moment". Long's competition with Owens is recorded in Leni Riefenstahl's documentary Olympia – Fest der Völker. Two days later, Long finished 10th in the triple jump. He went on to finish third in the 1938 European Championships in Athletics long jump with 7.56 m.
Long served in the Wehrmacht during World War II, having the rank of Obergefreiter. During the Allied invasion of Sicily, Long was killed in action on 14 July 1943. He was buried in the war cemetery of Motta Sant'Anastasia, in Sicily. He was survived by two sons, Kai-Heinrich and Wolfgang. Kai was born on 13 November 1941 and Wolfgang was born on 30 May 1943, but died on 6 March 1944. Long and Owens corresponded after 1936. In his last letter, Long wrote to Owens and asked him to contact his son after the war and tell him about his father and "what times were like when we were not separated by war. I am saying—tell him how things can be between men on this earth". 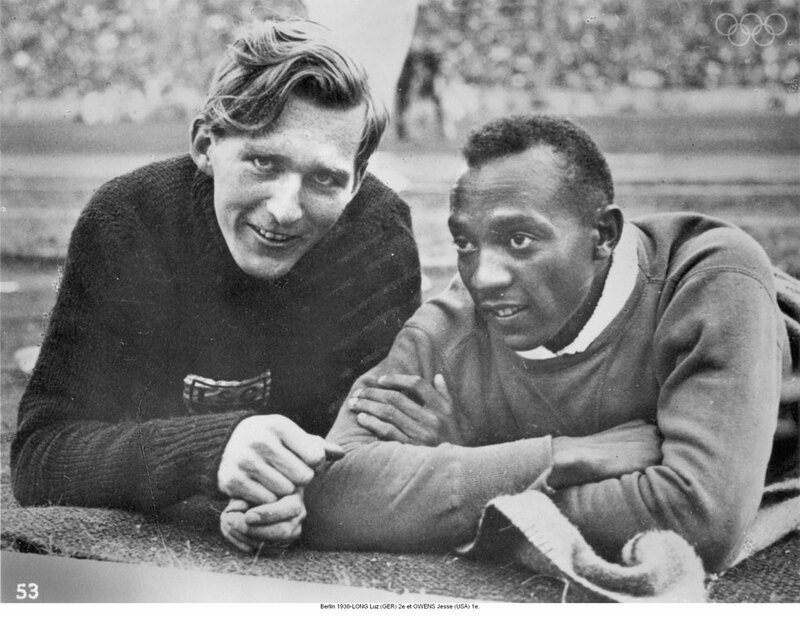 After the war, Owens travelled to Germany to meet Kai Long, who is seen with Owens in the 1966 documentary Jesse Owens Returns to Berlin, where he is in conversation with Owens in the Berlin Olympic Stadium. Owens later served as best man at Kai Long's wedding. Roads near sports facilities in Long's home town of Leipzig, and in the Munich Olympia Park of 1972 are named after him. His medal, photos, and documents were donated to the Sportmuseum Leipzig. In the film Race, he is played by David Kross. ^ "Luz Long Bio, Stats, and Results | Olympics at". Sports-reference.com. Retrieved 2013-03-26. ^ a b Schwartz, Larry (2007). "ESPN.com: Owens pierced a myth". Retrieved 2008-08-14. ^ a b Luz-Long-Ufer – Dr. Luz Long (1913–1944). Mehrmaliger Deutscher Meister und Europarekordinhber bei den Olympischen Spielen 1936 in Berlin. Im zweiten Weltkrieg in Italien gefallen. ^ Scritto da Administrator. "Lutz Long". Comune.mottasantanastasia.ct.it. Archived from the original on 2013-06-16. Retrieved 2013-03-26. ^ "Letters of Note". Retrieved 2016-08-16. ^ Yates, David (September 21, 2014). "Sunday Documentary: Jesse Owens Returns to Berlin". andBerlin. Retrieved May 21, 2016. ^ "Sportmuseum". Sportmuseum-leipzig.de. Retrieved 2013-03-26. Kai-Heinrich Long: Luz Long – eine Sportlerkarriere im Dritten Reich. Sein Leben in Dokumenten und Bildern. Arete Verlag, Hildesheim 2015, ISBN 978-3-942468-26-8. Transcript of letter sent by Luz Long to Jesse Owens from Sicily while he was serving in the Wehrmacht. "Tell him about his father"
This page was last edited on 16 April 2019, at 19:17 (UTC).